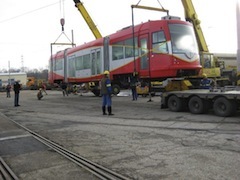 The Streetcars that will ride the rails in Anacostia in 2011 or 2012 left Ostrava, Czech Republic today first via flatbed truck, and then they’re bound for a cross-Atlantic ship to get here to the District in about 4-6 weeks. The three cars cost $10M to procure and have been in storage at the manufacturer for the last two and a half years. In addition, we’ve had to extend their warranty, despite being kept in storage since manufacture. They’re a fairly hefty investment in the new streetcar system, and hopefully we’ll one day see them on our streets! No word where they’ll be stored while we wait for the rails to be built.